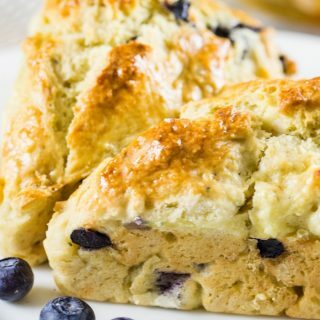 Blueberry Scones are a treat to enjoy anytime! 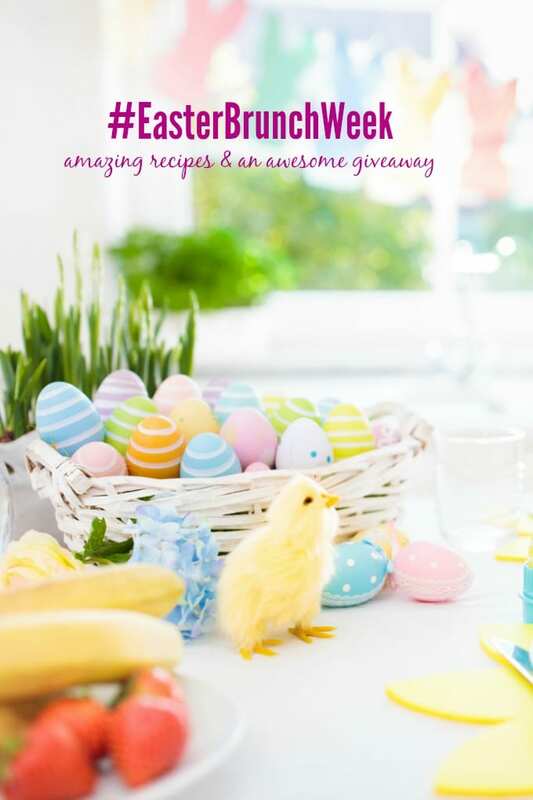 They are perfect for Easter Brunch and Mother’s Day! These scones have a nice crunchy exterior and a light and fluffy inside! Pour a cup of tea, get out some marmalade and make yourself some scones! 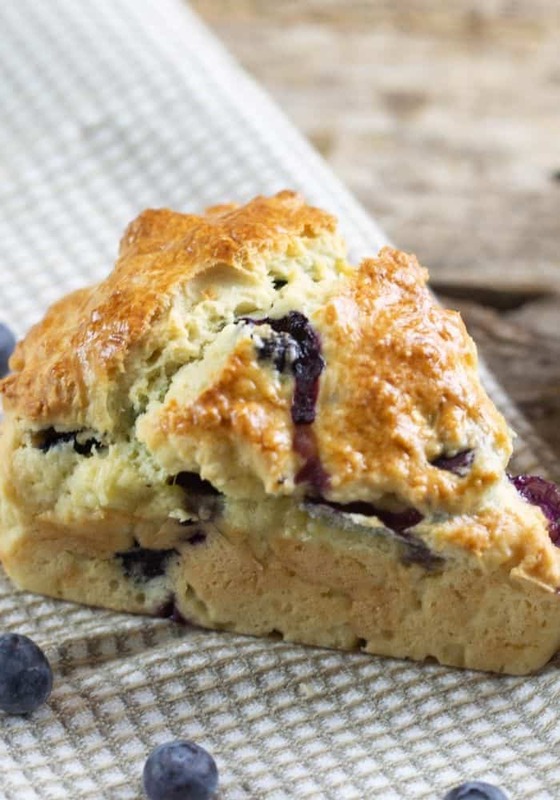 These blueberry scones got the Granny Annie stamp of approval so you are in for a treat! 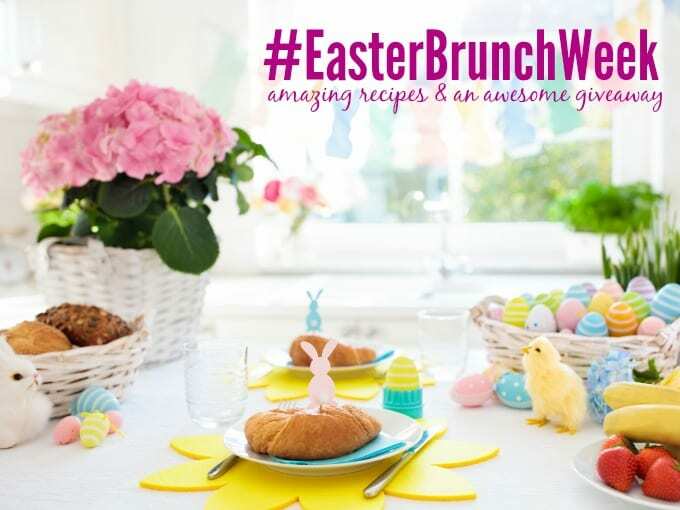 Easter Brunch Week cannot is almost over and a scone recipe is necessary! When I think brunch, I go right to scones! 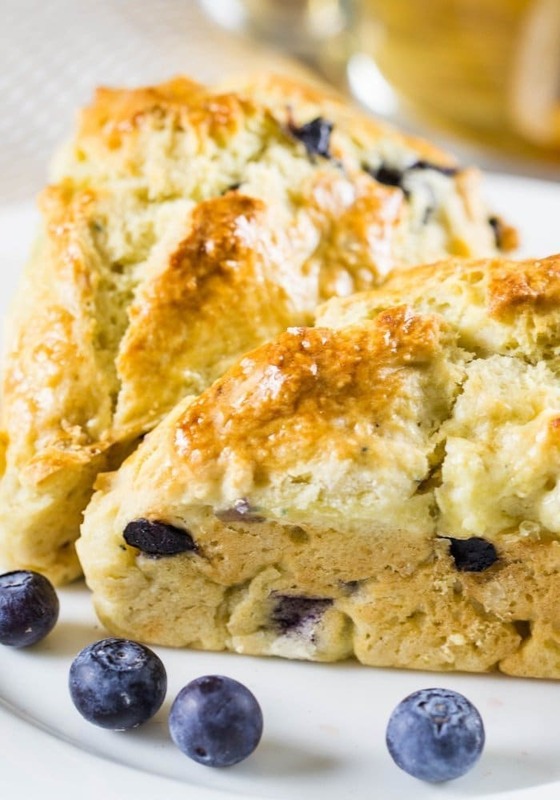 Blueberry scones are not traditional Irish scones. I have got to share that recipe with you another day! The blueberries make these a sweeter scone. We call them tea scones because my family loves them with a nice cup of tea! As we continue our Easter Week journey, I was so excited to receive a Scone and Cornbread Maker from Nordic Ware! I make a lot of scones and cornbread and using the scone bread maker makes such pretty and perfect scones! 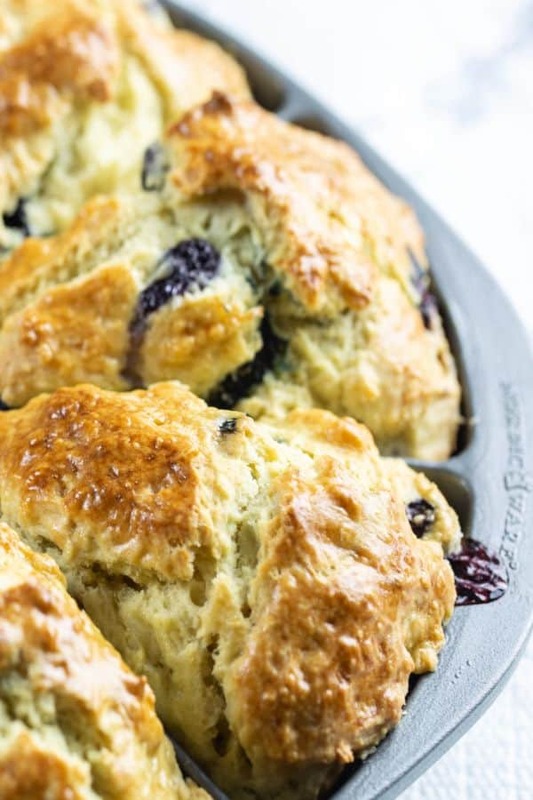 Delicious Blueberry Scones in a Nordic Ware Scone maker, pin to make later! Scones are one of my favorite things to bring to a Brunch or Breakfast Buffet. My family loves scones and I love making different varieties! My glazed cranberry orange scones are a stable in the house. Blueberry scones are another long-time favorite! I love it when the family comes and and takes in a big whiff and they say, “SCONES??? ?” They love every scone recipe! Fresh blueberries are a great fruit to use in scones. They are hearty and hold up well when baked. You can also use either frozen or dried but fresh blueberries are my favorite! Can blueberry scones be frozen? Yes. Once baked, place the scones on a baking sheet in the freezer. Let them set about an hour, then they can be placed in a freezer storage bag until ready to use. How do you reheat blueberry scones? Reheat the scones in the oven at 350 degrees for about 5 minutes. Wrap the scones in aluminum foil for reheating. What is the best way to defrost scones? Place the frozen scones in the fridge to defrost. Reheat for about 5 minutes. How Do You Make Blueberry Scones? Butter the scone pan and sprinkle pan with flour. Mix dry ingredients into a bowl. Cut the unsalted butter into the dry ingredients. Whisk the buttermilk and egg together. Stir the buttermilk mix into the flour/butter mix. Once blended, transfer to a floured surface and gently knead 2-3 times. Cut into triangles and place in scone pan. Bake for about 25 minutes. Test center of scone by pricking with a toothpick. Blueberry Scones are light and fluffy. Perfect for Easter Brunch, Mother's Day, Bridal Showers! Crispy exterior with a light and fluffy interior filled with blueberries! In a large bowl combine flour, sugar, baking soda, baking powder, and salt. Cut in the butter with either a pastry blender or forks. Note 2. Gently fold in blueberries. Whisk eggs into buttermilk. Stir the mixture into the flour/butter combo till combined. Turn dough out onto a lightly floured work surface. Knead a few times, 4-5, shape dough into a rectangle and divide dough into 8-10 triangles and transfer to the scone pan. Brush tops of the scone with the egg wash. Bake in the oven for about 25 minute. Test tops by using a toothpick into center of scone. Toothpick should be clean. Remove from oven. Let cool about 5-10 minutes. 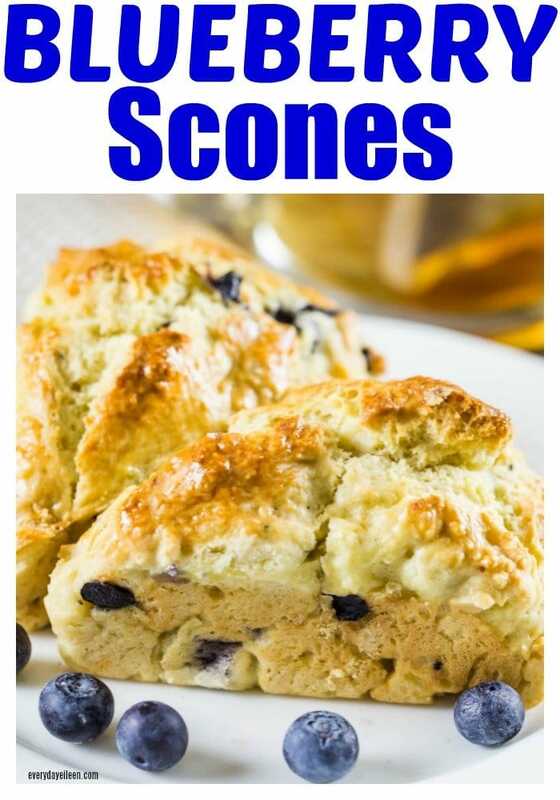 Remove scones and finish cooling on a wire rack. Feel free to pop one open and enjoy with some butter or jam. Note 1: Fresh blueberries are my favorite. Frozen blueberries or dried blueberries can be used. Note 2: I have used clean hands to blend in the butter into the flour.